OUTDOOR EXPO CLEVELAND is a Family Event. There will be a vast variety of vendors, guns, knives, clothing, jewelry, toys, preserved foods, crafts, rattle snake pit and much more. Outdoor EXPO in Stancil Park will have many vendors for outdoor activities, "How To" seminars, Kids Zone (for kids of all ages), food and even a "Dunking Booth". Don't miss the "Summer Kick-Off" event in Cleveland Texas. Vendor and Carnival game vendor opportunities available. 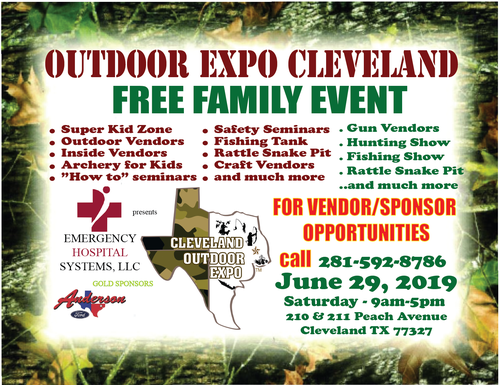 OUTDOOR EXPO CLEVELAND IS FREE with lots of Family Fun! Inside vendor tables, outside booths and food vendor spaces are available. CLICK HERE for Civic Center Floor Plan. Registration for tables in the Civic Center CLICK HERE! CLICK HERE for Stancil Park Layout. Registration for vendor booth in Stancil Park CLICK HERE! Registration as a Food Vendors CLICK HERE!